Ronnie O'Sullivan is "nowhere near as good as he used to be" but still remains the best in the world, says Mark Williams. 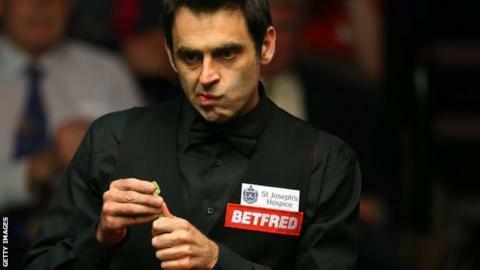 Wales' Williams, 40, faces five-time champion O'Sullivan in The Masters first round at Alexandra Palace on Tuesday. Englishman O'Sullivan, 40, returned to the professional tour in December 2015 after an eight-month sabbatical. "It's just a freak how good he is," Williams added. "There's not a player around that can play like him. He's nearly 41 and he's a country mile in front of any other player." Five-time world champion O'Sullivan did not defend his UK Championship title in October but made his comeback at the German Masters qualifiers in December. He beat Pakistan's Hamza Akbar 5-1, but lost 5-3 in the second qualifying round to world number 62 Stuart Carrington. It was his first tournament since losing to winner Stuart Bingham in the World Championship quarter-finals in April. Williams, Masters champion in 2000 and 2003, returns to the invitational tournament three years after his last appearance. "I haven't been here for a few years now and whatever happens, whatever the scoreline, either way I'm just going to enjoy it," said Williams, who is ranked 14th in the world. "I'm going to enjoy this one probably more than I have done for the last few times that I've been here. My game's OK but it's not in really good shape compared to what I used to be."